I think the major differences in Texas style chili over what most of us know as chili, is that it is most often made from chopped beef off of a whole roast, like a braising roast, or even venison, rather than ground beef, or heaven forbid, chicken. There are more chilies, whether they are reconstituted dried, powdered or chopped fresh, and it's heavier in cumin and chili powder for heat and never, ever beans cooked in. Having some pretty solid Texas roots in my bloodline, and more than a few people I love living there, I did a goodly amount of research before deciding to write a recipe for a chili that is in any way remotely tied to Texas. Texan chili purists, while I do welcome your comments on a proper Texas chili, please note before you critique that I don't call this "authentic" Texas chili, but only "Texas style." No rants please. No two Texans will agree on what is authentic. A beef roast or venison meat base is most typical - though sometimes freshly ground beef of some kind is also used. Seasonings often include onion, though some will argue the onion should be served raw as a garnish and not cooked in, garlic, a variety of chopped chilies along with some ground cumin, salt and pepper - the key ingredient being chilies or chili powder, and they use plenty of it. No beans. Period. Although it is acceptable to offer them as a garnish at the table. Some tomato is often used to give the chili body, but not enough that it's spaghetti sauce, so don't overdo it. If you use it, don't use much. It is usually finished with corn masa or cornmeal, which adds just a hint of sweetness and thickening power to help tighten the chili. Regular all purpose flour or even cornstarch may be substituted, though you will, of course, lose the corn flavor. Cut roast into 1/2-inch sized cubes and use paper towels to pat the meat very dry. I used a chuck. In a large pot or Dutch oven, heat the bacon fat or oil over medium high heat and add the beef, in batches, to brown. Don't crowd the pot - you don't want to steam the meat. Remove and set aside. Look at that beautiful fond y'all! Add the onion and peppers to the pot, saute for 4 minutes. Add garlic and cook another minute. Stir in all of the seasonings. Now.... if you're not familiar with Texas style chili, this is where it can get tricky. Texas style chili is big and bold. A full tablespoon of cumin, somewhere between 2 to 6 tablespoons of chili powder, 2 teaspoons of oregano and 2 teaspoons salt are the seasonings called for here - way, way more than many of us are accustomed to. In contrast, my chili recipes you'll see here will have significantly less of these seasonings, so keep that in mind and start on the low end the first time you season this. Return meat to the pot. Add a 14.5 ounce can of diced or stewed tomatoes, one can of mild, original or hot Rotel tomatoes, both undrained, a tablespoon of tomato paste, 4 cups of beef stock or broth (I used water and 1 heaping tablespoon of Better Than Bouillon beef base), and, optional, but I like using it, 2 teaspoons of Kitchen Bouquet. You may substitute a good Mexican beer for part of the beef stock if you like. Stir well, bring up to a boil, reduce heat to medium, cover and cook for about 3 hours, or until the beef is tender. When there is about 15 minutes left, whisk together the masa harina and water until smooth. Stir into the chili and cook another 15 minutes, or until nicely thickened. Serve with optional garnishes such as pinto beans, steamed rice, green onion, shredded cheddar, sour cream, cilantro, lime wedges, tortilla or corn chips and cornbread. For more of my favorite chili recipes, visit my page on Pinterest! Cut roast into 1/2-inch sized cubes and use paper towels to pat the meat very dry. In a large pot or Dutch oven, heat the bacon fat or oil over medium high heat and add the beef, in batches, to brown; remove and set aside. Add the onion and peppers, saute for 4 minutes; add garlic and cook another minute. Stir in all of the seasonings. Return meat to the pot and add all of the remaining ingredients, except the masa harina and water. Stir well, bring up to a boil, reduce heat to a simmer, cover and cook for about 3 hours, or until the beef is tender. When there is about 15 minutes left, whisk together the masa harina and water until smooth. Stir into the chili and cook another 15 minutes, or until thickened. Serve with garnishes and cornbread. Cook's Notes: This is a small batch chili for about 4 to 6 servings - double or triple for bigger batches. May substitute Dos Equis or other Mexican beer for some of the broth. If you are not used to the heavy spice and bold richness of a Texas style chili, start on the lighter side with the seasonings and adjust to taste the next time you make it. If using stewed tomatoes, use kitchen shears to cut the tomatoes up right in the can. Also okay to use crushed tomatoes, or substitute regular diced tomatoes for the Rotel. No beans in a Texas style chili, though it would certainly be both appropriate and hospitable to offer a bowl of pinto beans at the table for those who wish to add them. Hot Peppers: Wear gloves when handling peppers. Depending on your access, use a mixture of any combination of fresh or dried peppers, depending on your spice tolerance. Texas style chili often uses poblano, serrano, Anaheim, red or green New Mexico chilies, jalapeno peppers, or a mixture of several, according to your personal preference on heat level. To reconstitute dried chiles, remove the stem and seeds and discard. Cut the peppers into strips, place into a bowl, and pour hot water that has been brought to a near boil over the top. Let them stand in the water for 10 minutes or until softened, then drain and chop. For chiles with tougher skins like New Mexico, place into bowl whole, pouring hot water on top and soak; drain, remove skin, slice, remove seeds and chop. For the Crockpot: Brown meat in batches and add to slow cooker. Saute vegetables and add to slow cooker along with all the remaining ingredients, except for the masa and water. Cover and cook on low for 8 to 10 hours, or until meat is tender. Whisk together the masa harina and water until smooth. Stir into the chili, cover and cook on high another 30 minutes, or until thickened. Never tried making Chilli, always on my list, this looks good! 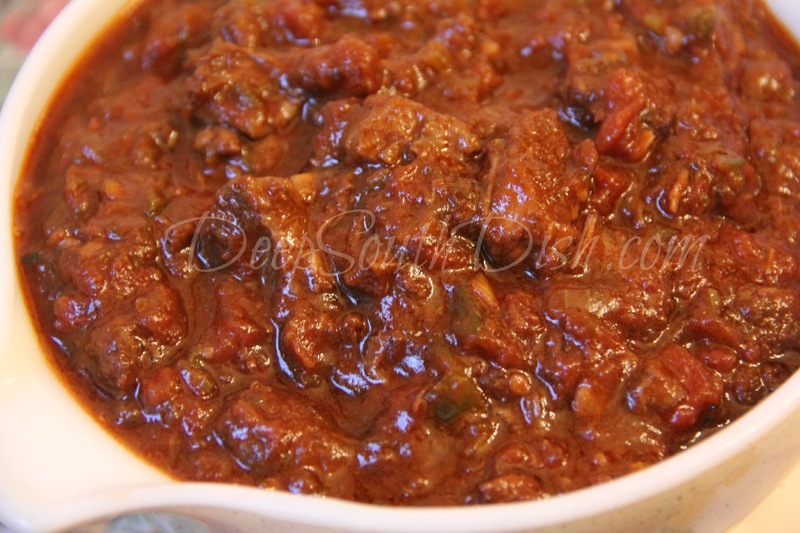 This is a bit different from many of the chili recipes that we have here - it's quite bold and spicy! You may want to check out some of my basic versions of chili before venturing into this Texas style versions! Your version looks very similar to what I've seen on chili cook-off TV shows and it sounds delicious. Thanks Larry! Texas style is quite bold - I admit I'm a bit of wimp I guess because I like good ole basic ground beef chili the best! I dunno Mary, I've been told REAL Texas chili never met a tomato (or a bean) lol. My first dissenter! Wondered how long it would take. :) You must've missed this in the body of my post "Some tomato is often used to give the chili body, but not enough that it's spaghetti sauce, so don't overdo it. If you use it, don't use much." The overwhelming majority of recipes I reviewed before writing mine did have some tomato, so I chose to go with. You also apparently missed this in my post "No two Texans will agree on what is authentic." I'm not a dissenter, I'm one of your biggest fans. I spam your site every chance I get lol. When my bartender today asked me how to cook Chicken and Dumplings, I got out my trusty phone and gave showed her the options you have here (even though I have my own recipe lol). I was just repeating what every Texan ever told me about their chili (I put maters in mine). I dislike Texans as much as I like your website lol. From Atlanta (I know I registered, but i forgot my registration info). LOL, I'm not allowed to dislike Texans. :) I was just teasing of course, but I did wonder how long it would be before somebody had a dissenting opinion! Chili creates a firestorm of controversy for some reason, and Texas chili tops them all - course seems Texans can't really agree on that either! Making it right now! Can't wait to try it later. Born and brought up in Texas....grandmother, mother and I (at 70) always included soaked pintos, ground beef, sauteed onion and bell peppers, seasonings and a bit of tomato sauce. In previous discussions with other native Texans on a recipe exchange list, we discovered that cooks in the panhandle, far west and northeast counties included beans more than their southern-county cousins. This was a surprise to us all as we thought all Texans made it like their own grandmother's chili! Texas covers a lot of territory - I can only imagine the variations of what might be authentic to one area versus another! In my neck of the woods we called your recipe "Chili Beans" which is not to be confused with "Chili"--(absolutely, positively NO Beans!!) They are two completely different meals. With Love From Seabrook, Texas!! This looks great (although it would probably kill me -- I'm a wimp). Why is there such animosity toward including beans in chili? I love beans in chili. I like it from a can, homemade, and restaurant made -- just so long as it isn't fire-dragon chili. I'm a wimp. But, no matter what kind it is, I love beans in chili. Is this frowned upon because it's seen as an "extender" and all meat chili seen as more pure or has more status somehow or ... ? You got me Kate!! I happen to like beans in my other chili recipes though I do have recipes both with and one without. It never fails though that I get the "no beans" or "where are the beans" when I share them on Facebook LOL!! This is real Texas chili. Many would add jalapeños too. If there are beans in your chile, you don't know beans about chili! Not original, but it works for me. Texas chili is definitely unique! Born and raised in North Carolina, I love the way most people I know make chili. Beef, beans, tomatoes....but I am very open minded when it comes to food. Just because it's not how I usually make it doesn't mean it won't be something that I might like. Always willing to try something different. Thanks for your variety of recipes! Pinning. Thank you thank you!! My boyfriend is a Texan and wanted real chili. I found and made this recipe and it is awesome!!! So compliments and thanks from a "real Texan"
Thank you Jennifer! 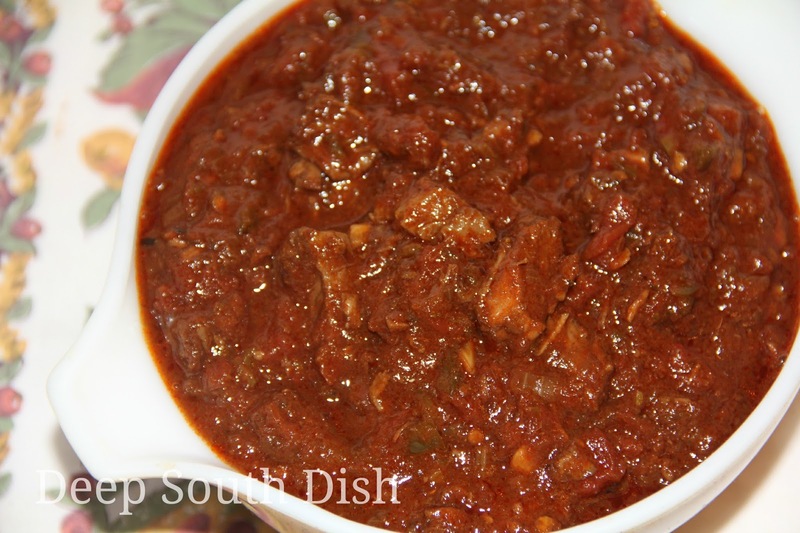 I was pretty hesitant to put up a chili with anything closely related to being a Texas version - it's quite different from the classic "southern" chili from my part of the south. I'm glad to see that it got the approval of a real Texan!! Fourth generation Texan here who regularly defies the bean ban. 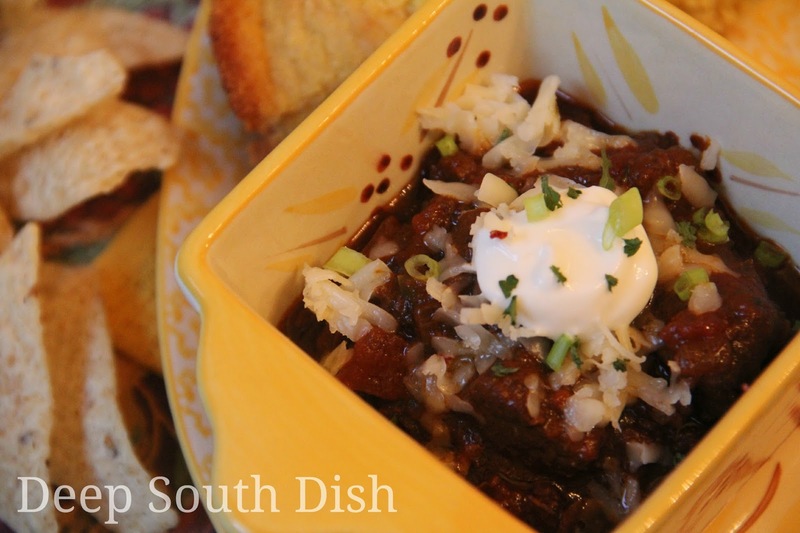 Being a Gulf Coast girl, I grew up with chili sered over rice with fresh chopped onions and shredded cheese and cornbread or saltines on the side. Married to a hunter from The panhandle, I make a mean lean venison chili. Heavy on the cumin and chili powder with just a touch of cayenne or chipotle. Always use some for of tomatoes and garlic and vary the the beans depending who is at the table. Rarely make it exactly the same twice. Who cares if it is authentic if it taste good. Second cold night in Arizona and I'm gonna make this for supper. Hope you enjoyed it Drake!